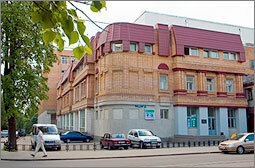 The Closed Joint-Stock Company "Scientific Production Enterprise 'GYCOM' (Gyrotron Complexes)" (GYCOM Ltd.) was established in 1992 by Russian experts working in the fields of plasma physics and development and manufacture of super-power vacuum microwave devices on the basis of the Institute of Applied Physics of the Russian Academy of Sciences and several Russian electronic-industry enterprises in Nizhny Novgorod and Moscow. The main lines of GYCOM's activities are scientific research, development, manufacture, and sales of high-power and super-power microwave devices operated in the millimeter wavelength band (mainly, gyrodevices), elements of millimeter-wave quasi-optical transmission lines, various measurement instruments and special power supplies, superconducting solenoids, as well as individual elements of vacuum microwave devices. GYCOM products are unique high-technology items. They are based on proprietary developments, characterized by high quality and reliability, and delivered to customers in Russia, Europe, North America, Japan, India, and China. The staff of GYCOM Ltd. consists of highly qualified experts and workers who have great experience of working in many fields of radio physics, electronics, and special engineering research, including 8 Doctors of Science and 37 Candidates of Science in Physics & Mathematics and Engineering. GYCOM Ltd. has the up-to-date manufacturing, engineering, and testing facilities required to perform efficient research, production, and business activities. The company is managed through the Central Office situated in Nizhny Novgorod and two branches, one in Moscow (GYCOM-M) and the other in Nizhny Novgorod (GYCOM-NN).